These easy buckwheat banana pancakes are gluten-free, oil-free, vegan and most importantly, absolutely delicious! Whip up a batch of these healthy 7 ingredient pancakes for your next cozy morning at home. Special Equipment: Electric griddle (or for a cooktop, a well-seasoned cast iron skillet or nonstick griddle pan). Note: I always have the best results when using an electric griddle. Tip! To keep pancakes warm, transfer to a baking sheet or baker and place in a preheated 200°F (90°C) oven. For an Electric Griddle: Preheat to 375°F (190°C) or For a Cooktop: Place a well-seasoned cast iron skillet or nonstick griddle pan over medium-high heat until hot. To test hotness, flick some water onto the griddle. When the water sizzles on contact, it’s ready. In a medium bowl, whisk together the dry ingredients: buckwheat flour, baking powder, cinnamon, salt and set aside. In another bowl, add the mashed banana (a few small banana chunks are fine), almond milk, vanilla extract and whisk until thoroughly blended. Lightly oil the griddle just before adding the pancake batter. For each pancake, pour about 1/3 cup of the batter onto the griddle and if necessary, spread it slightly with the backside of the measuring cup for an even thickness. Cook until bubbles form and break on the surface or when the perimeter has firmed up enough to be lifted, 3 to 5 minutes. Flip the pancakes and cook until the other sides are golden brown, 2 to 4 minutes. Keep an eye on them to prevent burning. Repeat the process with remaining batter, lightly oiling the griddle before the next batch. Serve immediately with toppings of choice. Refrigerate leftover pancakes for 2 to 3 days. 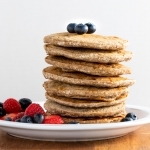 Buckwheat Flour: For this recipe I use freshly ground buckwheat groats to achieve that traditional golden brown pancake hue. Pancakes made from a store bought buckwheat flour will appear much darker but still delicious. Note: If grinding buckwheat groats, measure after the groats are ground into flour form. How to Make Buckwheat Flour: In a food processor, grind raw buckwheat groats until a flour-like consistency is achieved, about 1 to 2 minutes. (Or use a clean coffee grinder working in smaller batches.) Tip! Drape a kitchen towel over the top of the food processor to prevent a dusting of flour all over your countertop. Store leftover buckwheat flour in an airtight container in the fridge for best flavor.